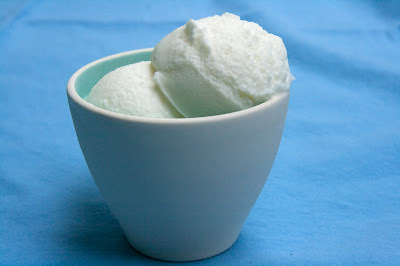 Recently, ice cream manufactures have started to take notice of the fact that homemade greek yogurt has a lot of fans. They’re stirring out higher quality frozen yogurts that highlight the natural flavor of the yogurt with other tangs in the dessert. Greek-style yogurt which is very popular is now also becoming a common base for frozen yogurts because of its flavor and consistency. 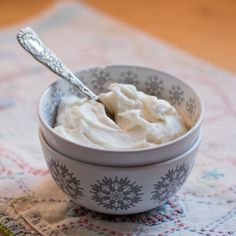 Homemade Frozen Greek Yogurt is a frozen yogurt recipe that one can easily make at home Greek-style yogurt as a base. Frozen yogurt can be made by using both regular and Greek style yogurt but later creates a richer tasting frozen yogurt because it is so much thicker than regular yogurt. This basic frozen Greek yogurt is vanilla flavored. You can use a little vanilla extract for flavoring. Use Italian meringue as it gives a wonderfully light texture to the yogurt and you don’t need to worry about using uncooked egg whites in your dessert. You can use either non-fat or full fat homemade greek yogurt for this recipe. The most important thing is to pick a yogurt that you like the flavor of; because it will come through in the finished frozen yogurt. You’ll get the best results with this recipe if you have an ice cream maker of some kind to churn your frozen yogurt base. The finished product will be light and smooth after churning. It can be frozen without churning but the consistency will be more like a frozen mousse than an ice cream. Bring it to a boil over medium-high heat. When sugar comes to a full boil, continue to boil for about 1 to 1/2 minutes. While the sugar boils, beat egg whites to soft peaks in a large, clean bowl. When the sugar is ready, continue beating the eggs at a low speed and very slowly stream in the hot sugar. When all the sugar has been incorporated, turn up mixer to high and beat until meringue is glossy and has cooled down to almost room temperature. Fold cold yogurt and vanilla into the meringue. Pour yogurt mixture into ice cream maker and freeze according to manufacturer direction.